UPDATE: Thanks to Aaron Sudduth for the tip that there are beta DisplayLink drivers available! They work on Windows 7 in addition to Windows 8. I downloaded them (version 7.0 beta 1), installed them, and when I plugged the Diamond BVU195 device back in, I pulled up the “installing drivers” dialog and skipped Windows Update driver checking. It found the beta drivers and everything started working again, including the third display and Office 2013! Problem solved! For a couple of years, I’ve used the Diamond BVU195 USB-to-DVI external monitor adapter (it’s relatively cheap on Amazon) so I could use my laptop monitor, an external monitor, and a second external monitor (third total) even though my Latitude E6420 Advanced Dock has two DVI ports, because the laptop only supports two monitors total simultaneously (including the laptop display) using its internal video card. This has worked great. However, I also wanted to try the Microsoft Office 2013 Preview. Which installed after a little difficulty but every time I tried to open it, would crash instantly when I tried to open any of the apps (Word, Excel, and Outlook are the ones I tried). 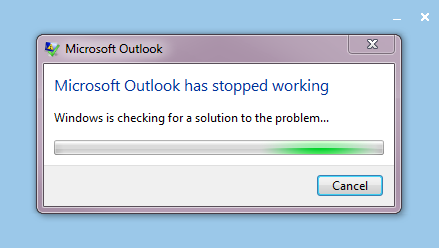 The splash screen (for Outlook, for example) would come up and along with it, a box with the title “Microsoft Outlook” that says “Microsoft Outlook has stopped working. Windows is checking for a solution to the problem.” and it would finish crashing, close, and I couldn’t use it. After some Google-fu, I found a site that mentioned something about DisplayLink, which is the company who makes the hardware/drivers for the Diamond adapter and many other similar adapters and third-party docking stations (they also make software that lets you use an iPad as an external monitor on a PC or Mac). I don’t recall which website it was with this hint, though I found another one that recommended these steps for disabling add-ins (which I eventually did for all non-included-with-Office-2013 add-ins as well once I got farther along). Anyway I checked my Programs and Features area in the control panel and discovered the DisplayLink Core Software that was installed (automatically through the Windows Update driver install of the Diamond device), and uninstalled it, rebooted, and Office 2013 worked! There were some compatibility issues that I fixed by disabling some third-party add-ins per my above link as well but at least I could start the apps and they all seem to work well! I reinstalled the DisplayLink adapter this morning in my office and immediately Office 2013 crashed on startup again. Uninstalled DisplayLink, rebooted, back to normal! There are some other pieces of software that seem to cause this, such as ABBYY Finereader and apparently in some cases some versions of Visual Studio (I saw references to Visual Studio 2010 Tools and Visual Studio 2008 Tools (for Office) and Visual Studio 2012 RC along with Visual Studio 2010, not sure what combination causes problems because I have Visual C# 2010 Express and Visual Basic 2010 Express that cause no issues for Office 2013). But with very little out there mentioning the DisplayLink issue, I figured I’d mention it here (I reported it to Microsoft with the “Report a frown” in Word as well). I’m running Windows 7 Professional 64-bit and Office 2013 Preview 32-bit, by the way. How do I like Office 2013 now that it runs? Too early to know. It functions closely enough to Office 2010 (including Outlook picking up all settings (three Exchange 2010 accounts) from Outlook 2010) that it’s been a mostly easy switch so far, but I haven’t gotten into it. The connectivity directly to SkyDrive and SharePoint sites is nice.